The ladies of the inaugural event! Having no idea what to expect at the inaugural Women’s Sportbike Rally, founders Kiri Hunter and Stephani McIntyre kept the event as low maintenance as possible to allow the event to materialize into something new and unique for women sportbike rider. With no budget and mild promotion, the end result was a bigger success than envisioned for a first time event. Overall there were nearly 40 women “taming the Dragon” over the course of the perfect weather weekend in August. Of those participants, several arrived solo while others brought an impressive show of support from their friends and significant others. 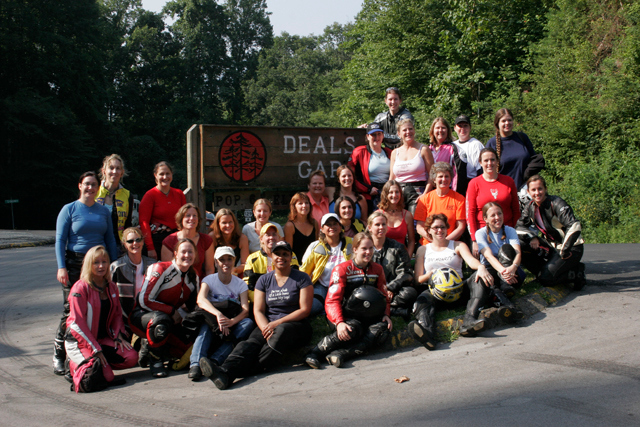 Whether they were three months new or 30 years into their riding career, everyone was equal in their desire for riding twisties and meeting with other women sport riders. The bulk of the rally participants stayed at the Fontana Village Resort while others stayed at other area accommodations in the Smoky Mountain region such as the Deals Gap MC Resort, The Treetops and more. Some of the festivities included a Friday evening Meet n’ Greet at the Hellbender Pit Stop located at the entrance to Fontana Village. Saturday was the big day which began with an impromptu breakfast meet followed by a photo opportunity at the “Crossroads” and overlook on the Dragon. Everyone broke into their own safe group sizes to spend the day riding the Dragon, Cherohala Skyway, Foothills Parkway, Hellbender 28 with a stop for some grub at the Brushy Mountain Smokehouse in Robbinsville followed by more riding. After a long, hot day we gathered for a BBQ pool side at the Fontana Village Resort Lodge. Everyone had many opportunities to meet and ride with the unique, laid back, funny and cool women along with their guests who attended. With the exception of a few minor glitches as expected with any new event, the first Women’s Sportbike Rally went off better than expected. Improvements and additions are planned for the new and returning participants for the 2007 event. • Kiri Hunter, co-founder of the WSR, who elected to step away from riding sportbikes to pursue a passion in aviation. Thank you Kiri for everything! • Corey of the Wilkinson Bros.
• All those wonderful groups and people who helped to spread the word and even added this event to their website such as www.wimausa.org,www.roadracerx.com, www.yourbikelife.com,www.womenridersnow.com and many motorcycle community forums and others that we may have missed with sincere apology. And finally and most importantly, a BIG thank you to those who believed in this event enough to participate in the very first one without expecting anything other than representing and supporting women sportbike riders!